I freely admit that everything in my life revolves around my children. When I am not with them, they are constantly on my mind. Now, I have the most beautiful mother’s bracelet created by Belly Charms so when we are apart I can just look at my mother’s bracelet and instantly feel close to them. Belly Charms jewelry designer, Sonya Mattey provided such excellent customer service as she helped me walk through the steps to create the perfect mother’s bracelet. 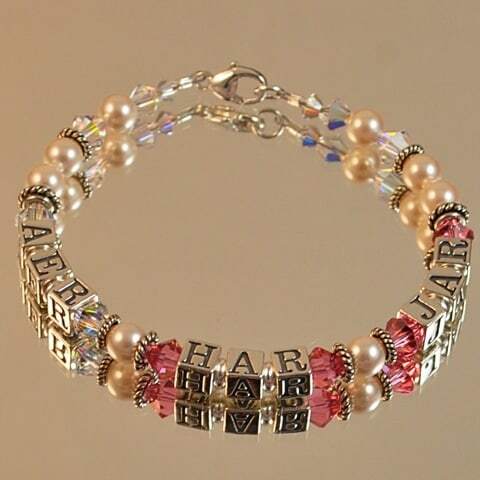 I decided on the beautiful Swarovski Pearl and Birthstone Initial Mother’s Bracelet. All three of their initials were surrounded by delicate and beautiful Swarovski Pearls and birthstones. The lobster clasp holds the Mother’s Bracelet securely in place so it is easy to put on and I don’t have to worry about it getting lost. 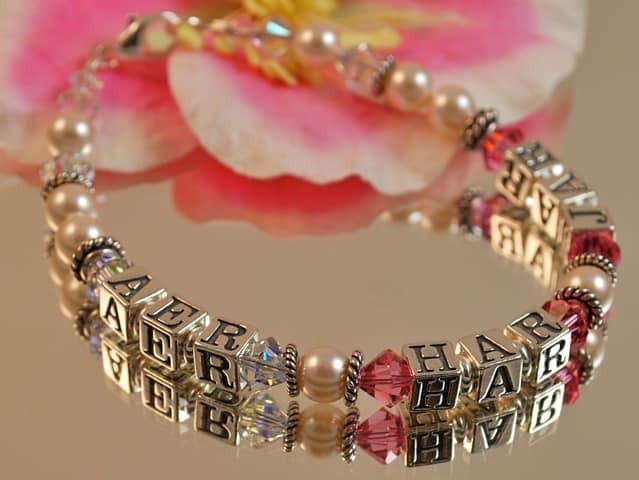 When my Swarovski Pearl and Birthstone Initial Mother’s Bracelet arrived, I was stunned. It was even more beautiful than I ever imagined when we were deciding on how to have it made and it shimmers and captures the light whenever it moves. I have been wanted to have a Mother’s Bracelet made for years and I am so glad that I chose Sonya from Belly Charms to design it for me. I couldn’t have dreamed of a more beautiful bracelet. If you have been thinking about getting a Mother’s or even a Grandmother’s Bracelet (think awesome Holiday Gift) then I highly recommend selecting your favorite from Belly Charms extensive collection. Belly Charms also has a fantastic selection of Pregnancy and Maternity Belly Button Rings. The Sterling Silver “Baby On Board” Maternity Belly Button Ringis absolutely adorable. At $14.99 it is a bargain and would make a fun stocking stuffer too. Ah…look at the “It’s a Girl” Maternity Belly Button ring. How cute! You can check out the entire selection of maternity jewelry accessories. I also want to let you know about Sonya’s beautiful sister named Sandi who is currently fighting for her life after being diagnosed with a malignant brain tumor. Sonya has created a beautiful line of Affirmation and Inspiration Jewelry-Sandi’s Fight with a portion of every sale going to help with her sister’s medical costs. The line is just gorgeous and attractively priced and would make a wonderful gift for a special person in your life and you can know that you are helping in the process. 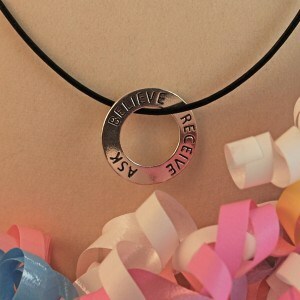 Belly Charms is offering my readers 15% off any order over $35 with the coupon code Stacie15. Offer valid until 12/25. Visit Belly Charms on Facebook, Twitter and check out their blog!